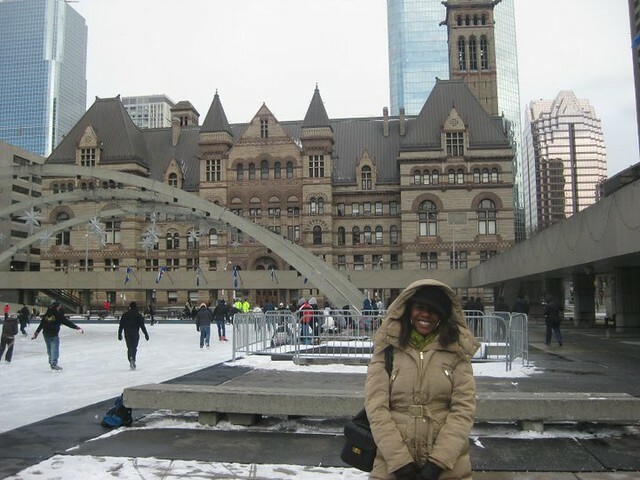 Guest blogger Nadine Stewart knows and loves Toronto very well - mainly because most of her family live there! In this 2 part series she will share with us all her Toronto insider secrets, starting with the best places to shop, see and get sporty. Outdoor ice skating at Nathan Philips square. It was so cold! Nathan Phillips Square and City Hall are very close to The Eaton Centre shopping mall (more details of this below!) In the summer the square is great for people watching, concerts, dance performances and outdoor exhibitions. In the winter months, it becomes an outdoor skating rink – perfect for cute dates. I love a bustling city that also has a peaceful waterfront. 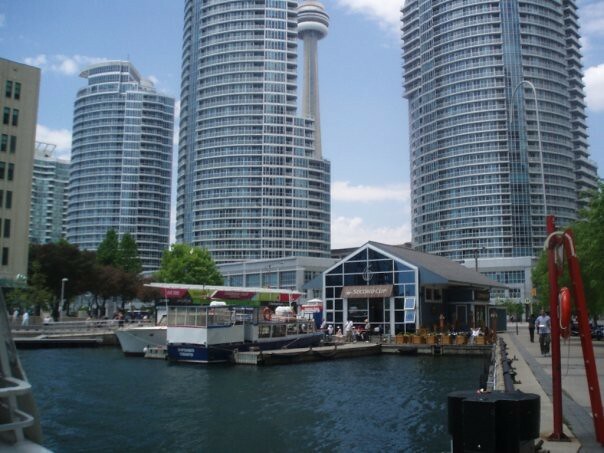 Looking out over Lake Ontario, the Harbourfront Centre consists of shops, restaurants, a hotel, marinas and visual arts exhibitions. I just love walking and people watching down by the river on a beautiful sunny day. 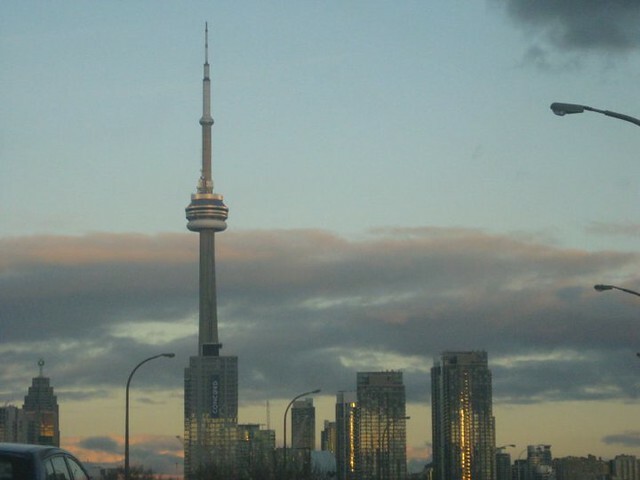 The CN Tower - isn't she beautiful?! I never tire of gazing at the CN Tower. Up until 2007 it was the world’s tallest free standing structure and I think it’s THE thing that makes the Toronto Skyline the impressive sight that it is. I went up the CN Tower a couple of times as a kid but as an adult I’ve been way too chicken to give it a go. However, the views are amazing and, if you’re brave enough, you can always check out the observation deck and its glass floor - 1,120 ft up in the sky! This eclectic downtown Toronto market is great for those cheap basics, cool vintage shops and independent designers. Very multicultural and diverse. For those willing to venture out of the city, Square One is a HUGE shopping mall in Mississauga, a suburb to the West of Toronto. It’s one of my faves. Their food court is amazing. This is the tourist’s shopping mall. Its slap bang downtown near all of the tourist attractions and contains all of the big chains – Victoria’s Secret, H&M, HMV, MAC , Zara and Levi’s (and yes, a Flight Centre) as well as Canadian-specific stores like Roots Canada, Canadian Tire and Shoppers Drug Mart. Sports fans are catered for in Toronto too. I once remember going to see the Toronto Blue Jays (baseball team) play at the Rogers Centre (then called The SkyDome) and thinking… but isn’t this just a bigger game of Rounders? Toronto Raptors v Oklahoma City Thunder, Dec 2010. We won! I love the ACC. My first ever Jay-Z concert was there back in 1999, a month after the venue first opened. 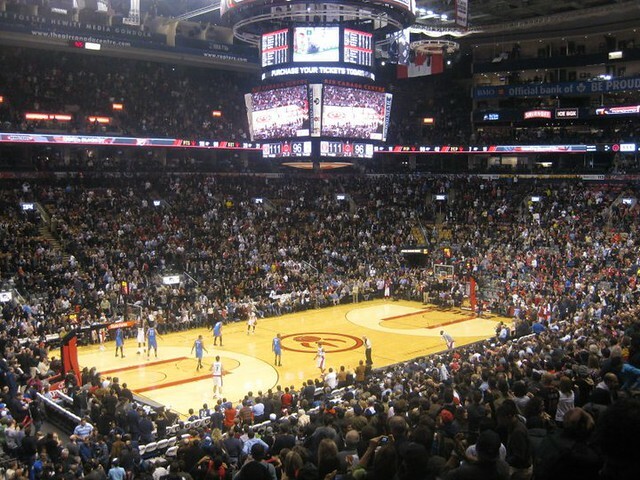 As well as being a music concert venue, the ACC is also home to the Toronto Raptors (basketball team) and the Toronto Maple Leafs (hockey team). I’m not a huge sports fan, but I went to my first Raptors game ‘just for the experience' in 2006 and now, I love it so much that I've seen the Raptors play not only twice in Toronto, but also supported them (in my Raptors t-shirt!) when they came to the London O2 to play the New Jersey Nets earlier this year. Another thing I love is that if the Toronto Raptors score over 100 points at a home game (win or lose), Canadian pizza company Pizza Pizza gives everyone a free pizza the next day. As long as you can show your ticket to prove you were at the game - dinner is on them! Enter our facebook competition before the 30th November to be in with the chance of winning £1000 to Explore Canada. Watch this space for part 2 of Nadines guest posts in which she reveals what to eat, drink and explore around Toronto.